A few days after our last posting we set off from Jogjakarta for Bali, with a planned stop at Bromo, the mountain volcano resort. We felt ourselves lucky to get seats on an "Eksecutif" (first-class, aircon) train to Surabaya as the approaching end of the Ramadhan holiday period meant heavy demands on transport. Arriving at Surubaya we wanted to go on all the way to Bromo, but also wanted to reach it before dark. It wasn't to be. The local "Economie" train that would take us 3/4 of the way, to Probolinggo, came and departed 1.5 hours late. We shared it with thousands of others trying to go home or return to their extended families. Early morning on Wednesday, October 27, we took a bemo to the Probolingo bus station and there felt ourselves lucky to find a bemo that would soon depart for Bromo. Gerry appropriated a seat for himself in the front, with the driver; this made four and we were all crowded. Jan, who started the trip with more room, learned the truth that there is always room for one more. Arrival in Bromo brought us to the edge of the crater and we, or at least Gerry, were very impressed. Jan was a bit less. But neither of us was impressed with the hotel under our noses; still we took it as we didn't really know how far it was to another. And it was perhaps the best of a bad lot. That afternoon we walked along the top of the crater edge and got some very good views. We saved the descent for the next morning because that was supposed to be when the views were best. But at 5:00 a.m. the next morning, when we set off, the entire crater was filled with fog. We tumbled as much as walked down a path inches deep in black volcanic dust and then across the floor of the crater through the fog for 35-40 minutes, using our compass. Amazingly we came to the right place. Just as we got there the fog lifted some and we could see the outside of the crater wall. Jan wimped out by hiring a horse for the last 200 meters up the crater wall to the bottom of the stairway; with much puffing Gerry made it on his own. Then we climbed up to the rim and, after we'd recovered our breath, enjoyed the view. That was just the beginning of a long, eventful day. Our goal, almost mission impossible, was to get to Bali that night in time to find a nice place to stay. The first step was to get down the mountain to the Probolingo bus station in time for the 11:00 Executive Bus direct to Denpasar. We made it to the station on time, and were overjoyed to be promised seats on the bus, which started at Surabaya. But the words came from a forked tounge; at the last moment we were rushed onto another local bus that took us only to Ketupang, the ferry port for Bali. We did get a nice ride through the most rural part of Java we'd seen. We arrived at Ketupang with two hours of daylight left, rather doubting that we'd reach our goal before dark. From the terminal bus station we took a bemo van a few kilometers to the ferry; there we made a good strategic decision: walk on board rather than get on a bus that would probably leave on the next ferry. We found a bus already on board that agreed to take us to Denpasar but when the ferry docked we could not reach it, so jammed together were all the vehicles. But our luck held and the left side of the cars departed first, leaving the bus waiting and accessible. The ride was hectic, with the driver hellbent on getting to Denpasar as soon as possible. Gerry meanwhile had decided we should get off the bus halfway to Denpasar at the surfing beach of Medewi. We liked the description of the Medewi Beach Cottages resort and hoped to get a room there, but wouldn't have risked it but for the existence of a much cheaper surfer hangout next door. At the rate the driver was going we expected to be in Medewi well before dark, but as things turned out we got off the bus just when we started to see lights coming on here and there. In the gathering dusk, Jan walked the hundred meters down to the resort and was delighted to find that they had a selection of rooms, a wonderful swimming pool, and some very nice tropical gardens, all at a price we could afford especially after the low season 20% discount. We chose an ocean-view room, dumped our bags, and headed straight for the pool. We were a bit non-plussed to find that the water in the pool was about ten degrees warmer than that in the poolside shower! But it didn't matter, it was water, and we wallowed in it in the tropical night air. The next four days require few words to describe: peace and quiet. We swam in the Medewi Beach Resort's fine pool everyday; even twice on a few days. After breakfast in the open-air pavillion it was back to our sea-view porch to read and watch the surfers just off shore. We made one outing, to the Hindu Rambut Siwi temple, six kilometers south. It's located on the shore, with six component temples and was worth it, but no match for more famous places. We'd been offered door-to-door transport from Medewi to Ubud but declined it deciding to take our chances on public transport. Monday morning of our last week in Indonesia we set out and had great luck: Our first bus arrived just 30 seconds after we did at the bus stop; our required two transfers were reduced to only one with others doing the work to carry our bags. In two-plus hours we were in the center of Ubud and set ourselves down in a restaurant before seeking a hotel. We experienced a bit of culture shock, seeing more people walk by in a few minutes than we'd seen in four days in Medewi. 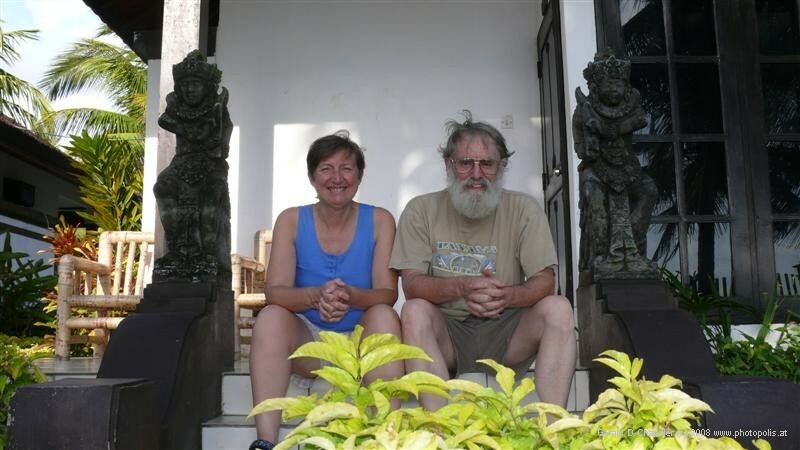 We'd been recommended Ketut's Place by a French couple, Joachim and Marie, that we met at Lake Toba, Sumatra; after lunch Jan set off to find it while Gerry had our first internet session in a week. We're not globally important; he found no significant news. Jan found and liked Ketut's place and we were soon checked in. It's built on a narrow lot, with individual bungalows as crowded together as people are in a Balinese painting. We got a room with a terrace overlooking a narrow ravine; it was a great choice. Ubud is far bigger and there are more things to do than Medewi. We avoided being hyper-active but did some of them: we made the requisite trip to the Monkey Forest where we narrowly avoided an attack by hungry monkeys. We skipped all the dance events, feeling that our two Ramayana performances in Jogjakarta were enough. Jan lightly sprained her ankle and stayed by the pool on our second to last day when Gerry went to Batur Mountain and lake, which he found pretty but not as pretty as Bromo. That brings us up to this morning. We'll pack, make a last appearance at the internet cafe where we will post this, and then it is off to the airport. In less than 24-hours we will be in Sydney, having achieved all of the Beijing - Bangkok and Bangkok-Bali route by surface means and starting our Australian adventure only six years late!